This article is a short summary of Mario Kart 7. 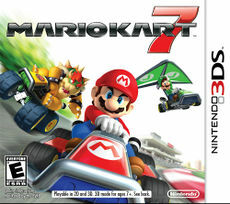 Mario Kart 7 is the Nintendo 3DS installment in the Mario Kart series. The game marks the introduction of several new elements into the franchise, such as the new environments. It is also the first game in the series to be worked on by an outside developer; in this case, Retro Studios. DRIVE, DIVE, AND GLIDE TO VICTORY! Explore new ways to play online and compete in 8-player worldwide matches! Take racing to new heights with the all-new glider. Propel past opponents on wild new courses. Unlock unique kart parts and customize your ride. While the game plays similarly to past installments in the series, Mario Kart 7 introduces gliding and underwater segments, in which the player deploys a glider and can steer through the air and drive underwater respectively. Coins also return and can be found along the track. Other gameplay mechanics such as tricks and drafting also return. In addition to the control pad, players can also race from a first-person perspective and steer using the system's gyroscope. For the first time in the series, Mario Kart 7 introduces full kart customization; players can choose from a selection of kart bodies, tires and gliders rather than pre-built karts, and can unlock more by collecting coins. In the Mario Kart Channel, players receive time trial records every day via SpotPass, as well as playing custom-made Grand Prixs received via StreetPass that have either just been received or through a list of players StreetPassed; in addition to the courses the player can also alter their vehicle and change the Mii that is sent. Mario Kart 7 returns to the eight-player format used in most Mario Kart games up to that point rather than twelve like in Mario Kart Wii. Players can join up to seven other players locally or online. When playing online, players can race worldwide, against friends or previously-raced opponents, or create or join communities with custom rules. 1.1 May 15, 2012 Fixes a shortcut exploit for Wuhu Loop, Maka Wuhu, and Neo Bowser City online; the glitches still remain in offline modes. This page was last edited on 11 September 2016, at 22:18.